'S ann à Wikimedia Commons a tha am faidhle seo agus faodaidh gu bheil pròiseactan eile 'ga chleachdadh. 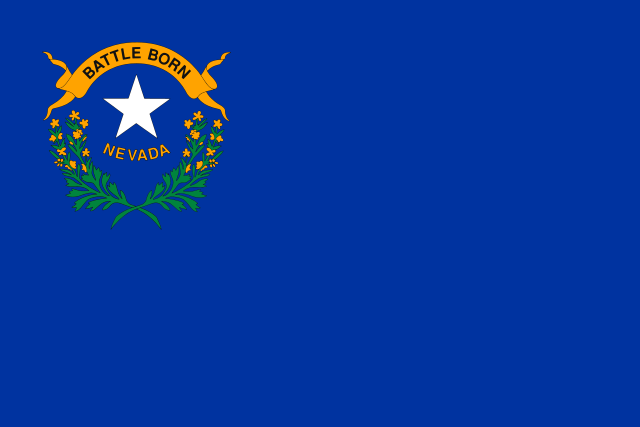 Chì thu an tuairisgeul a tha aice air [duilleag tuairisgeul an fhaidhle https://commons.wikimedia.org/wiki/File:Flag_of_Nevada.svg] gu h-ìosal. Tùs Original vector image from OpenClipart: usa_nevada.svg. This work is based on a work in the public domain. It has been digitally enhanced and/or modified. This derivative work has been (or is hereby) released into the public domain by its author, Wine Guy. This applies worldwide. Wine Guy grants anyone the right to use this work for any purpose, without any conditions, unless such conditions are required by law. 10:15, 14 dhen Mhàrt 2010 750 × 500 (42 KB) Wine Guy Corrected colors according to Nevada statutory description; various tweaks of canton. Air a tharraing à "https://gd.wikipedia.org/wiki/Faidhle:Flag_of_Nevada.svg"